The combination of Arduinos and Node.js allows us to do a lot of unexpected things. 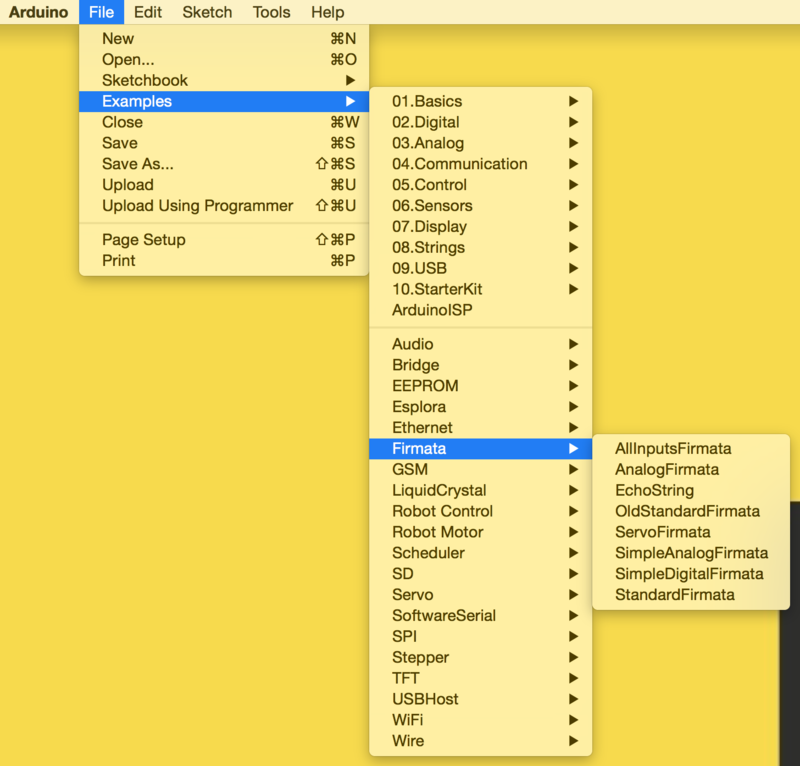 In this article, I’ll show how you can create a remote control for your Mac via Arduinos, Node.js and AppleScript. If you are new to combining Arduinos and Node.js, I’ve previously covered turning on LED lights and displaying web API data on LCD text displays. Our Arduino remote control will increase and decrease our Mac’s volume, tell our Mac to play an iTunes playlist of our choosing and set it to stop whatever is playing on iTunes (which is likely to be that playlist!). Keep in mind, this demo provides access to commands directly on your Mac – there is the potential for this to be misused or harmful if you provide too much access! Keep it for personal use rather than big corporate projects. Now the all important part of the article – what all of that code means! Lets go over how everything fits together. In order to interface with our Arduino board, we are using johnny-five. We start by setting up our johnny-five module and our Arduino board through that. Then we define variables to store our five buttons. We also set up our exec() function which is what allows us to run AppleScript commands from Node.js. 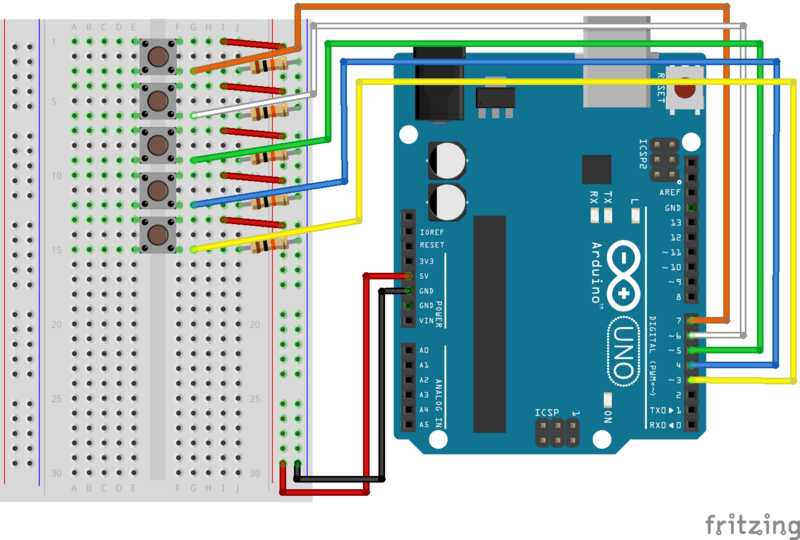 When johnny-five lets us know our board is ready to use, we run a quick console.log and define our five buttons and the Arduino pins they are connected to (7, 6, 5, 4 and 3). On each button’s down event, we run a different function. On our first button, we run the askiTunes() function which sends iTunes a request. In our case, it is requesting our “Top 25 Most Played” playlist. The askiTunes() function executes our first bit of AppleScript using the exec() function. All of our AppleScript commands run within Node.js using the command osascript. Our askiTunes() function runs the command osascript -e 'tell application \"iTunes\" to "+event+"'. This gives us a generic command telling iTunes to do something. We can adjust what that something is via the event variable. When done, we run a console.log just so we know that the event has been recognised. Our second button runs the same askiTunes() function but we pass it the event of stop to stop anything that is currently playing. If we had more buttons to play with, we could add buttons to pause and a generic play event that’ll resume what is currently in queue. Our third and fourth buttons turn our Mac’s volume up and down via a function we’ll call setVolumeLevel(). As you can see, we’ve got a value in that JSON object called 'output volume'. We add five to the volume level on our third button (increasing it) and reduce it by five on our fourth button (decreasing it), then we pass that value into the function to make the change happen. Our setVolumeLevel() function uses the AppleScript command of set volume output volume to change our Mac’s volume to the level we’ve passed it. We also run a console log just so we can keep track of the volume level requests. When our AppleScript code has been run, we call getVolumeLevels() which is our function that sets up all of our currentVolLevels values and keeps track of our Mac’s volume. I’ll explain it in detail after we’ve covered our final button. That aforementioned final button runs the toggleMute() function that’ll mute and unmute our Mac. Our toggleMute() function looks at the currentVolLevels['output muted'] and uses either osascript -e 'set volume without output muted' to turn off muting or osascript -e 'set volume with output muted' to turn it on. If currentVolLevels['output muted'] is true, then we set the keyword to 'without' to take away muting. If it is false, we set the keyword to 'with' to turn on muting. 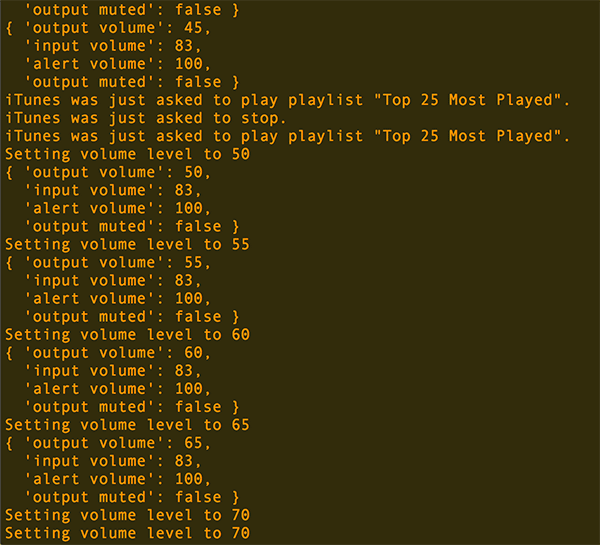 "output volume:5, input volume:83, alert volume:100, output muted:false"
We then iterate through each string in the array, rearranging it neatly into our currentVolLevels JSON object. To do this, we split each key/value pair into an array called vals using the : character as our splitter. vals will be each key such as output volume, whilst vals contains the actual volume level values. We use vals as our JSON object key, e.g currentVolLevels[vals] = something. There is one factor we need to keep in mind and account for in the volume levels that get returned. One of these values is a true/false value (our muted/unmuted status) whilst the rest are numbers. All of these are represented as strings and need to be converted. We’ll do this via a simple if statement that looks at the value of vals. We check for the string of "true" and the string of "false". If we find either of these, we set the relevant value inside currentVolLevels to be the matching boolean. If it is neither of these, we parse the string into an integer that will represent a numeric volume level and store it inside currentVolLevels. Our package.json file is rather simple in this case and mainly needs to ensure we’ve got the johnny-five and serialport npm modules installed. If you’re not a big music fan or you don’t use your Mac for your music, there are a bunch of other AppleScript shortcuts you could hook up your Node.js server to. Here are a few ideas. You’ve now got a neat way of making your own personal Mac peripheral! If you wanted to make it work as a portable device, you could set up either websockets, socket.io or a basic HTTP server, give your Arduino Wi-Fi or some other way of accessing your Node.js server remotely (or use something like a Particle Photon or Particle Electron microcontroller, and then make these exec() calls based upon remote commands (please be careful though, exec() can be misused!). There’s plenty of opportunity for some very fun projects here! As always, if you do make something neat, leave a note in the comments or get in touch with me on Twitter (@thatpatrickguy), I’d love to check it out!